Dirocco B comes away with Division Champion 6YO Young Jumpers! Boucanier impresses with a 4th of 98 placing in the $2,000 AD Sport Horses 1.30m. 1st time in the "big" arena! Speedy Quandorette Z follows with a 2nd of 66 also in $2,000 AD Sport Horses 1.30m classes. Devin is pleased with the performance of all his young horses in their opening week of the 2014 show season. Congratulations also to Sima with her impressive start! She placed 5th & 6th out of 58 in the $1500 Low Junior Jumpers on her horses Zopala and Chantilly followed by a 6th of 65 place with Zopala in the $10,000 Low Junior Jumper Classic. She also rode 7 YO Tailwind, for owner Barbara Rowland, to a 2nd of 53 in the Low Junior Jumpers. Devin Ryan, of Long Valley, N.J., took the Devon Fall Classic by storm Thursday, winning three classes, including the $5,000 Welcome Stake. Ryan won the time-first, jump-off Welcome Stake aboard Boucanier with a clean round in the jump-off in 33.75 seconds. Irish Olympian Kevin Babington, now living in Gwynedd Valley, placed second on Shorapu. Ryan also took the 1.3 meter Open Jumpers competition on Quandorette Z and the 5 year-old Jumpers class on Dirocco B.
Devin rode Dillandra to the top finish of the $20,000 SHF Enterprises 5 Year-Old Young Jumper Championship at the Hampton Classic. He also finished third with Cooper in the 6 Year-Old Young Jumper Championship. 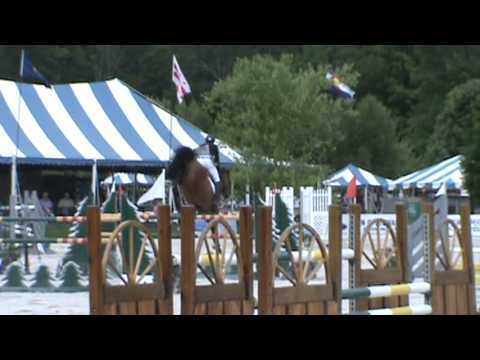 Devin and Zosja win the $30,000 Otter Creek Grand Prix of the Manchester Classic, week 3 of the Vermont Summer Festival held in East Dorset, VT. They were the only double-clear round of the day. No Worries and Devin take 3rd $100,000 Wells Fargo Grand Prix of Devon! From a field of 28 riders, including Olympic challengers Mclain Ward and Beezie Madden, Devin and Barbara Rowlands's No Worries capture 3rd place in the $100,000 Wells Fargo Grand Prix of Devon. They were 1 of only 3 to have double clean rounds.